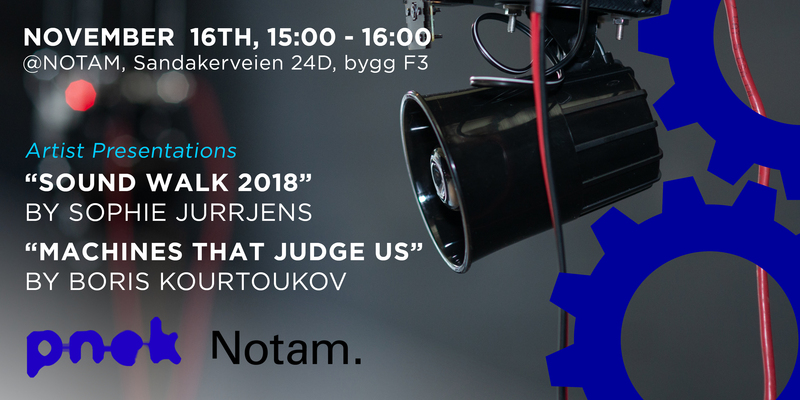 NOTAM and PNEK invites you to artist presentations by Dutch artist Sophie Jurrjens, who will present her work “Sound Walk 2018”, and Boris Kourtoukov talking about his project “Machines that Judge Us”. Both works works were developed as part of the Summer Sessions Residency at V2_, Rotterdam in 2018. Kourtoukov was the selected artist by PNEK to develop his work at V2_, while Jurrjens was partly hosted at PNEK/Notam.